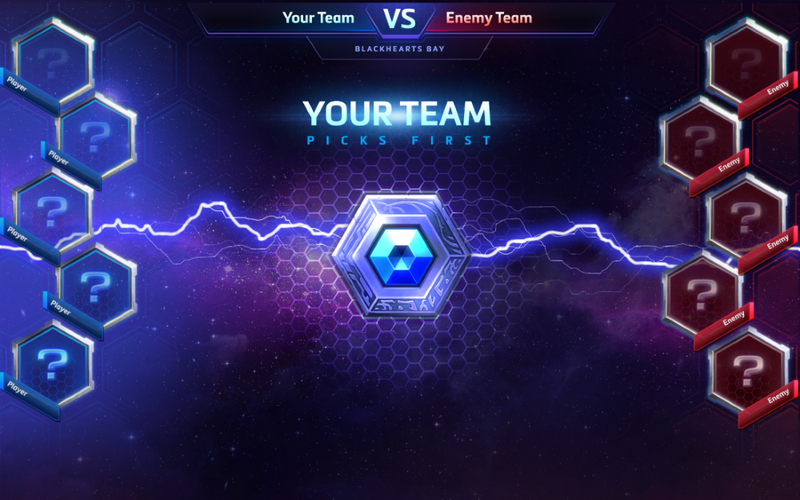 At BlizzCon 2014, we revealed a little bit about how ranked play will work in Heroes of the Storm. Today, we’d like to give you a more detailed look at our initial implementation for Hero League and Draft Mode, which we’ll open for testing once Closed Beta begins on January 13. As you read through the rest of this post, please keep in mind that this is our initial implementation for Hero League and Draft Mode, and we’re looking for your help in playtesting these features thoroughly during our Closed Beta phase, and beyond. Hero League and Draft Mode are not yet complete, and we have a number of improvements in store with future updates. We know there are Heroes players out there who don’t just want to win -- No, they want to be the best! If this sounds like you, then you’ll definitely want to spend some time playtesting Hero League, which will allow you to compete in ranked Heroes matches against others of similar skill. While changing game modes, you may also notice that Versus has been renamed to Quick Match. We made this change to help indicate more clearly which Hero Select format you’ll use when playing in the Quick Match (blind pre-pick) and Ranked (draft) game modes. You’ll also technically be playing “versus” other humans in both Quick Match and Draft Mode, so it made sense to give Versus a more fitting name. You must reach Player Level 30 or higher. You must own 10 or more heroes. It is important to note that the weekly free hero rotation does not count toward this requirement, as you may only draft pick heroes that you already own. If you’ve met the requirements mentioned above, you’ll see your current rank, win/loss record, and a few notable stats displayed on the Hero League Play Screen. From here, click “Ready” at the bottom of the screen to jump into the Hero League queue alone, or in a party of any size. While you can queue for Hero League using a party of any size, the matchmaker will always prefer pitting parties of equal size against one another. For example: Say that you queued for Hero League with two friends, and matched with two other allies who each queued alone. In this case, the matchmaker will attempt to match you against an enemy team consisting of a party of three, and two solo players. The matchmaker will also search the Hero League queue in order to place you with and against players of similar skill. 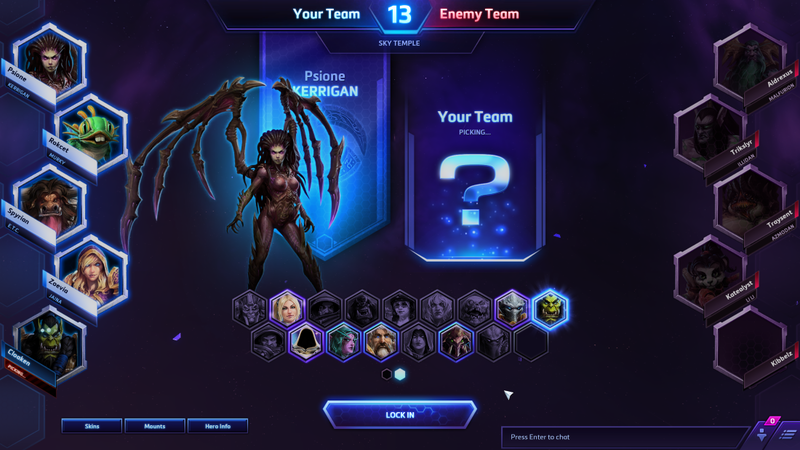 Hero League will use a matchmaking rating (MMR) that’s separate from your Quick Match rating. This is also an individual rating, meaning that it is unique to your own performance, and will not change based on different parties or players you buddy up with. Everyone will start their Hero League journey with a blank slate in terms of MMR, which may initially cause Hero League matchmaking to feel a little wild while the matchmaker learns more about each player’s individual skill level. The more Hero League games are played, the more accurate matchmaking will become. Once you’ve found a match, you’ll enter draft mode, where you’ll build your team composition for the game that lies ahead. In Draft Mode, teams will take turns selecting the heroes they’d like to play as when game begins. The Battleground on which you’ll be brawling will appear at the top center of the screen, and a coin will be tossed to determine which team picks first. The team that wins the coin toss will be prompted to pick one hero on the first turn, and then the opposing team will select two heroes. Teams will then alternate picking two heroes at a time until just one player remains on the team that lost the coin toss. Only the heroes that you own will be available to you during Draft Mode, and no purchases are allowed after a match has been found. When it’s your turn to pick, you’ll have 30 seconds to lock in your hero selection. If the timer runs out before you’ve made a decision, your most recently highlighted hero will be automatically locked in, or one will be selected for you at random if you did not already have a hero highlighted. As mentioned at the top of the article, once a player on either team locks in a hero, no one else can select or play as that hero during that game. This is also why you must own at least 10 heroes in order to compete in ranked play. With nine or fewer, it’s entirely possible that other players could snap up all of the heroes you own before you’ve even had a chance to pick! Enemies won’t be able to see your chat messages in Draft Mode, so you’ll want to communicate closely with your allies in order to build an effective team composition. 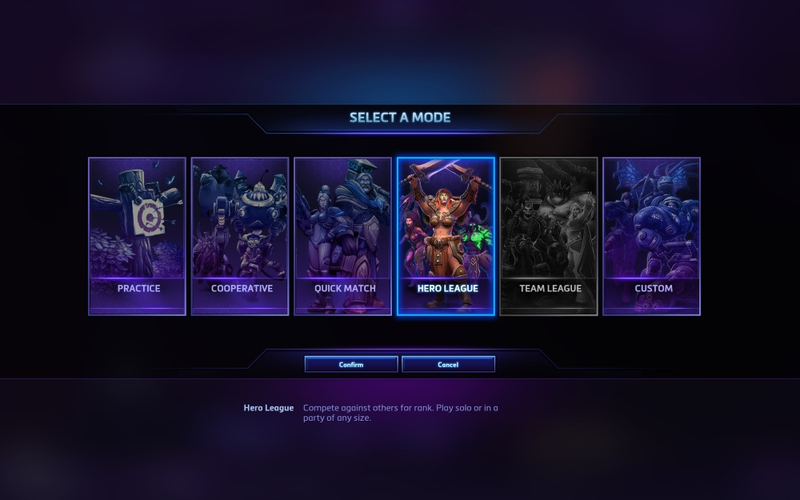 If any player quits during Draft Mode, the game will be cancelled, and all players will be sent back to the Hero League Play Screen. 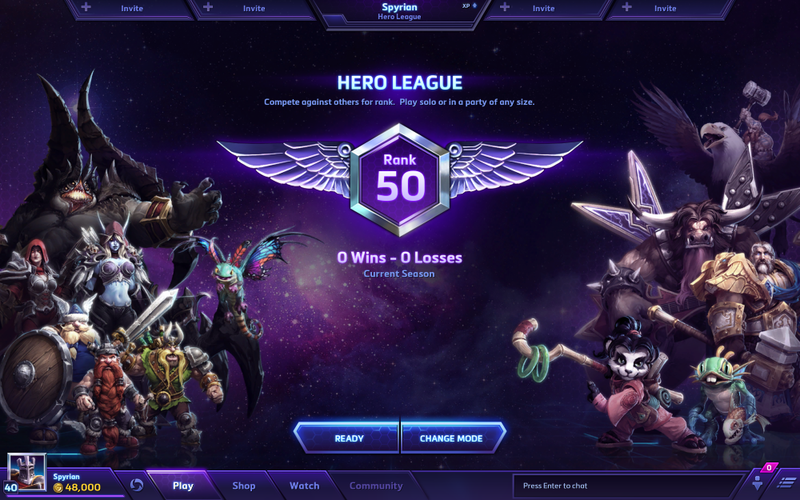 You’ll begin your Hero League journey at Rank 50, and with each game you win, you’ll earn points toward promotion to the next rank. The top players among you will soar to new heights in pursuit of the coveted Rank 1, where you’ll compete among the best of the best that Hero League has to offer. Each game you lose, however, will also result in a loss of points. Just as consistently winning games will result in promotion to the next rank, losing enough consecutive games will result in demotion to the previous rank (though not below Rank 50.) You will, however, receive a small point buffer after ranking up, which will help prevent immediately de-ranking if you lose your first game after being promoted. In the future, we’ll implement seasons, in which you have a limited amount of time to see how high you can climb before your rank for that season is recorded and reset. The start of Closed Beta marks a testing phase for our initial implementation of Hero League, so we will not kick off official seasons until ranked play is in a much more polished state, and Heroes becomes available to a much broader pool of players. We want ranked play in Heroes of the Storm to be a competitive and fun experience for players at all ranks and skill levels. Players who abandon games before they’re finished not only bring down team morale, but also hurt the competitive experience for all nine of the other players. For these reasons, we plan to implement a few penalties for game abandonment with our next patch. Any player who leaves an in-progress Hero League or Quick Match game, and does not rejoin before it is finished, will be prevented from playing any ranked games until they complete a new Quick Match game. That player will also still earn or lose ranked points depending on the outcome of the match he or she left prematurely. Again, please keep in mind that these penalties are a work in progress, and we know they fall a little on the strict side. We plan to bring improvements to this system, and make the rules more flexible, with future game updates. After our last patch, you may have noticed that a new, but disabled, “Lobby Mode” dropdown menu was added to the Custom Game lobby organization screen. With our next update, you’ll be able to use this dropdown to change up how Hero Select will work in each of your Custom Games! 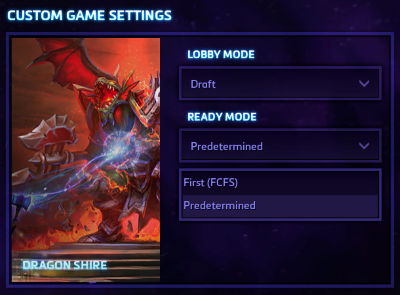 By switching the Lobby Mode to “Draft” and the Ready Mode to “Predetermined”, you can change the Hero Select experience in your Custom Games to mirror the draft picking process used during Hero League games. We’ve also enabled a “First Come First Served (FCFS)” Ready Mode, which is another drafting option that allows teams to first decide on a hero, and then who on the team will lock in that hero. Finally, changing the Lobby Mode back to “Standard” will allow you to use the blind pre-pick Hero Select process found in Quick Match games. Those among you who love playing Heroes as part of a dedicated team may be pleased to know that we’ll also be implementing a Team League Mode for Ranked Play with a future update. This will be an even more competitive experience than Hero League, but we’ll have more to share on that in the weeks to come. We hope you enjoyed this preview for Hero League and Draft Mode. Until next time, we’ll see you in the Nexus!